A while back, I was informed that there were large numbers of German immigrants who settled in Missouri (with the Missouri Lutheran Synod, go figure, right?) I still lived in somewhat of a denial that many Pomeranian immigrants must have made their way there, believing that it must have been from other areas of Germany. However, I received an email this week that surprised me. The Callies family from Tempelburg immigrated to the United States in 1871, settling in the area around St. Louis, Missouri. The main person from this narrative was Heinrich August Ferdinand Callies, born in 1844 and known as “August” throughout his life. His family’s legacy is chronicled throughout Annette Callies’ blog, “Callies From Pommern,” which is the legacy of her husband’s family. In Annette’s blog, she details about their arrival in the United States with very detailed notes. Unlike my family’s history, her family was able to preserve a large number of documents and papers from their ancestors’ lives, everything from immigration papers to guild certifications. She even has the passport from August’s immigration, which was stamped by the North German Confederation. Her website is beautifully laid out and is sure to help anyone curious about their Callies heritage in Tempelburg. Pictures diagram where houses used to be and the changes since. Maps help those unfamiliar with the area build a mental picture of where everything is. And like most family histories wrought with myths and legends, Annette’s family is no different. As the story goes, the Callies were from Alsace-Lorraine. 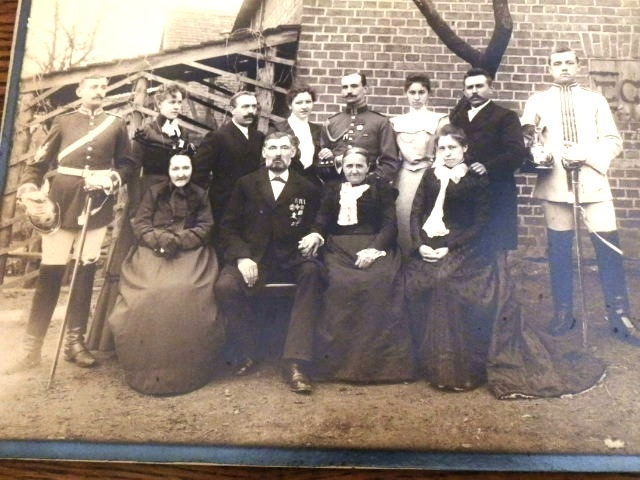 It wasn’t until a relative died and her belongings were explored that the family discovered their roots in Pommern. Now, however, the clock is ticking. Annette’s husband was diagnosed with ALS and has a limited amount of time to find answers to his questions. How is the family connected to Alsace-Lorraine? What happened to his family that was expelled from Pommern and are they searching for their family as well? Callies From Pommern is an excellently documented website for anyone researching their Callies family and is worth a visit even if you aren’t related. Documents that were scanned give a rare glimpse at the history from the time. Many of papers are extraordinarily difficult to find and are carefully preserved in digital format for future generations, giving anyone the ability to see what documents from that time period looked like. Are you a Callies? Annette welcomes you to contact her via any one of the links below. Her family tree is extensively documented on Ancestry, and her husband has taken both autosomal and Y-chromosome DNA tests (if you’re curious to see if you are a match). The Callies Family Tree contains several generations of family members who stayed in the Tempelburg area of Neustettin. Master Blacksmith Th. Callies, on the occasion of his retirement as the Chief-Master of the local Blacksmith Guild, was awarded an artistically executed honorary plaque by the Chamber of Crafts of Stettin. This was given to Mr. Callies on Monday by Mayor Bauer in the presence of the Board of the Blacksmith Guild at a formal ceremony with an affectionate speech and the best wishes for a healthy and happy retirement. Mr. Callies, deeply moved, expressed his gratitude and promised further to do all that is within his power for the common good of the Guild. Annette started her blog to share her husband Rod’s family history. He has ALS, which means that he has limited time to research his family. With the time that he has, Rod is writing his memories. With the assistance of Annette, the two are hoping to answer some questions about the family. Where is the Alsace-Lorraine connection? What happened to his family in the expulsion? They welcome others to contact them with any information or to share in their family’s story.